We know the White City of Tel Aviv like the back of our hand. 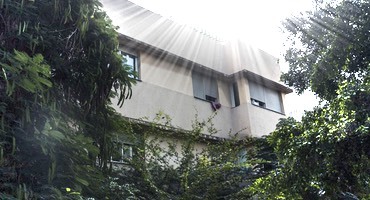 Touring 10,000s of visitors every year in our popular Bauhaus Tour, we learned that a lot of tourists to Tel Aviv prefer to stay in one of the Bauhaus buildings – and we are happy to give our recommendations for Hotels (see our Bauhaus Hotel Recommendations here) and Apartments below. On Airbnb and other booking-services there are indeed plenty of Bauhaus apartments available. We are happy to recommend the apartments below, and we would love to get your inputs for additional tips and apartments to add here over time. We are not affiliated with any of these providers, but we receive a small compensation if you click on the links below for your booking. Thank you for supporting Bauhaus Center, we are proud to present you with up to date content and Bauhaus tours since 2000. 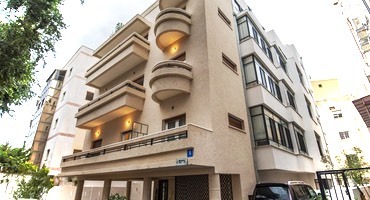 Reines 5 is a typical renovated White City Bauhaus building in a great location off Dizengoff Square. While the original International architectural Bauhaus style is preserved on the outside, the renovated apartments meet all the needs of contemporary travelers. Available for short term rent are studios and two-bedroom apartments, all with private kitchens and bathrooms, as well as apartments with balconies overlooking the nearby square or the small garden, offering you the proper Tel Aviv-lifestyle feeling. Most of Sheinkin Street was completely rebuilt in recent years, most of it in the spirit of the old Bauhaus buildings. The apartments on Sheinkin 30 offer a distinct Tel Aviv flair in a new building. Rothschild Boulevard, countless great restaurants and many of the touristic sites as well as the legendary Tel Aviv nightlife are a stroll away. The apartment features a terrace, 1 bedroom, a living room and a well-equipped kitchen with an oven. A flat-screen TV with satellite channels is ready for your use. Bialik Street and Bialik Square is one of the iconic streets in the center of Tel Aviv’s White City. who has developed a warm atmosphere, this spacious apartment, 80m2, bright and quiet is on the second and last floor of a historic and classified Bauhaus building. The master bathroom has a small tub, and the second bedroom’s bathroom features a shower. The spacious living room includes a sofa, two armchairs and a LCD TV with access to cable channels. A work area is designed to comfortably host a computer, WIFI included. The sofa in the living room can also be used as a single bed. Last but not least, there are a number of agencies offering Bauhaus apartments in Tel Aviv. Look at the offerings for example of Tel Aviv Vacation Apartments and take your pick.